relishments HAS MOVED! | Food, life, love and flexitarianism. Not always in that order. I have been hoping to relocate my blog for a long time now and I am so excited that the day is finally here! Now Brian can stop listening to me complain everytime I want to do something on my blog that WordPress.com wouldn’t let me. I’m really excited about the flexibility the WordPress platform is going to offer me. Confession: I am recipe dependent. I have an incredibly hard time coming up with meal ideas without step-by-step instructions. Inspiration just doesn’t come to me like that. As a result, I’ll probably never make it to Top Chef. Oh well. 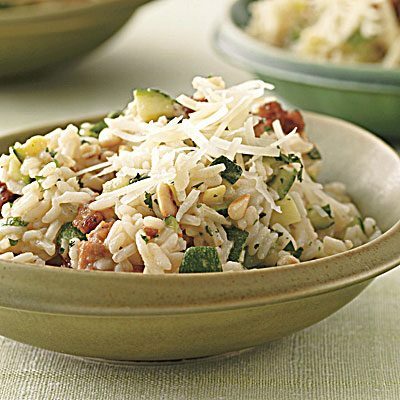 I read the recipe for Sausage-and-Zucchini Rice but I thought it seemed a little bland…and I didn’t want to be stuck with another boring Rachael dish. Then I did something unthinkable (for me): I altered it before I even made it! Basically, I cut down on the butter and chicken broth and added a lot more vegetables. I’m really happy with the way it turned out. 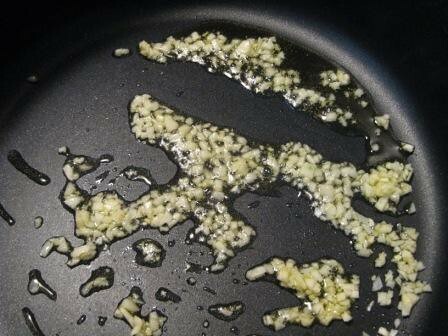 In a saucepan over medium heat, melt the butter. Add the onion and cook, stirring frequently, for about 5 minutes. Add the chicken broth and rice. Bring to a boil. Lower the heat, cover, and cook for about 20 minutes, or until the rice is tender. While the rice cooks, grab a large skillet. Over medium heat, cook and break up the sausage into small pieces until it is cooked through. With a slotted spoon, move the sausage to a paper towel lined plate. Add the zucchini, carrots and celery to the skillet and cook for about 4 minutes, or until the vegetables are cooked to your liking. Return the sausage to the skillet and add the corn and mushrooms. Cook until heated through. If you skillet is big enough, you can mix the rice with the vegetables right in the skillet. 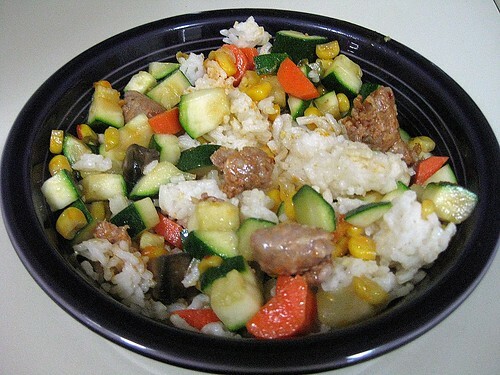 Otherwise, serve the rice in bowls and then serve the vegetables and sausage on top. Enjoy! Hopefully there are many more “recipe independent” meals in my future. Somehow, despite the fact that I’m still not working, life got kinda crazy last week. Also, I’m sometimes a really lazy blogger. I could write a whole post about that. But I won’t. Even when I’m not posting, I am cooking. Here’s a brief look at what went down in my kitchen last week. They were “totally awesome” (if you’re my sister, you’ll get that. Otherwise, I’m sorry). 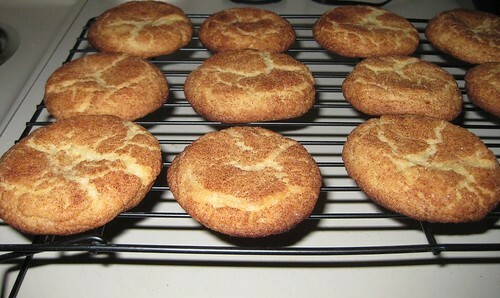 I would make more this week, but I have other plans for my oven. Highly, highly recommended. Definitely not bad, though not very spicy. We put the filling and cheese into whole wheat tortillas and attempted cooking them on my George Foreman grill. 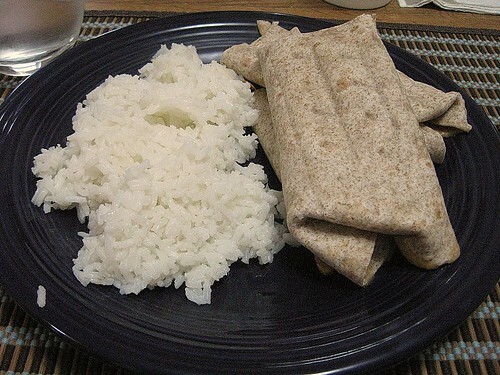 Final analysis: The burritos were fine, though would’ve benefited from a bit more spice and crunchier tortillas. The lack of crunch was probably my fault and next time I’ll try cooking them in a skillet. However, Brian and I were fans of the whole wheat tortillas, which we’d never had before, so those will definitely reappear on a future shopping list. 6 Ways to Organize Your Pantry from Zesty Cook. Which reminds me, I said I was going to reorganize my pantry…fridge…cabinets when I moved in a month ago. That still hasn’t happened. Maybe I’ll do that today. Or not …if I reorganize things then I might not know where the are. Organized chaos seems to be working well for us. September is Hunger Action Month and Feeding America is running a Give a Little, Feed a Lot campaign. The idea is to give up something little (lunch, a haircut, music downloads) and instead give the money to feed a lot of hungry people. The calculator is an awesome way see exactly how many meals your donation would provide. Gourmet has a good list of ways to reduce your carbon footprint every time you go to the supermarket. I’m a lot more conscious in my eating than I was a year ago, but I still have a long way to go, especially buying organic and local. From Endless Simmer, 3 reasons why Mark Bittman should get more time on television. C’mon, you knew if there was anything about Mark Bittman this week I was going to link to it. The man changed my life and How to Cook Everything Vegetarian is definitely the most used book in my kitchen. Save the Planet. Save Your Wallet. Use a Water Bottle. The Atlantic published a piece this morning titled “What Will Break Our Bottled Water Habit”. It features a really great slide show and mentions several ways in which people are trying to draw attention to the fact that “about 86% of plastic water bottles in the U.S. end up as garbage or litter.” That’s a lot of water bottles! This is my Klean Kanteen stainless steel water bottle. I bought it last fall at L.L. Bean in Freeport (check them out, they have different colors!) and it has served me very well since then. The purchase was a bit unneccessary; I had recently stopped bringing disposable bottled water to work every day and was using a Nalgene water bottle at the time. However, I really liked the look of the Klean Kanteen bottles and the fact that it would fit in a car cupholder…and, being from Maine, I have a love for L.L. Bean, so I bought a new water bottle for myself. Definitely one of my best purchases. I love my Klean Kanteen. The water always tastes good and, for some amazing reason, seems to stay cool. It’s also highly durable–my poor bottle has taken a few good falls (out of my hand, off the roof of my car…I’m a bit clumsy) and though the paint is a little chipped, the bottle is fine, even after over a year of very regular usage. Brian’s bottle is plain stainless steel and his looks really good. Mine just looks well loved–I take it to school, I take it to the gym, I take it on car rides. It’s pretty much always with me. So, if you’re ready to kick your disposable water bottle habit, either to help out the planet or your wallet, I highly recommend the Kleen Kanteen. And neither Kleen Kanteen or L.L. Bean is giving me anything for saying so. My mother-in-law is a really good cook. I’m not just saying that because I know she’s reading this, it’s true. She’s also extremely willing to pass along recipes, which is great for my Rachael Ray filled recipe binder. Plus, it always works in my favor to cook something from Brian’s days at home once in a while, especially since we know it’s been well tested. 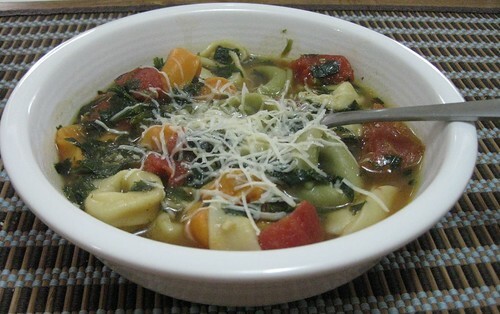 One of the recipes she’s given me that I’ve made several times is a soup of tortellini, tomato and spinach. Fortunately, to make this soup, you don’t really have to be a good cook. You also don’t have to have a lot of time, or a lot of ingredients. It’s that easy. Who could ask for more? adapted from my mother-in-law, serves about 4. 1. Heat olive oil in a large saucepan. Add 2 cloves crushed (or poorly chopped, in my case) garlic and cook for 2-3 minutes. 2. 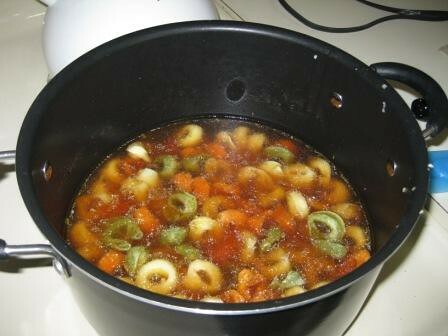 Add vegetable broth and tortellini. Heat until boiling. 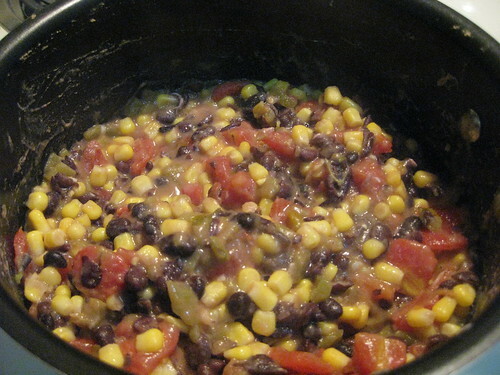 Reduce heat and simmer, covered, for 10 minutes. 3. 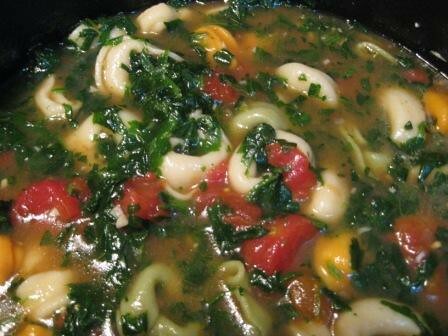 Add spinach and tomatoes. Simmer for 5 more minutes. 4. Serve topped with grated Parmesan cheese. Could it be any easier than that? One of the best things about this recipe is that all the ingredients can be kept on hand to use for those times when you don’t know what to make for dinner. Perhaps in an effort to make up for my lack of posts this week (I made meatloaf and it lasted us several meals), a somewhat longer than usual list of highlights from my Reader. Seems like there was a lot of interesting stuff on the web this week. If these aren’t enough, remember you can always check out “What I’m Reading” on my right side bar. Michael Pollan’s “Big Food vs. Big Insurance” in the NY Times connects health care and food. “… Three-quarters of health care spending now goes to treat “preventable chronic diseases.”…We’re spending $147 billion to treat obesity, $116 billion to treat diabetes, and hundreds of billions more to treat cardiovascular disease…” Crazy. This piece in The Atlantic about the cost of year-round tomatoes and the people that harvest them gave me a lot to think about. In the past I’ve consumed a lot of winter tomatoes. However, Gourmet just published a piece reporting that things are improving a bit for the migrant tomato workers because of the implementation of a “Fair Food” program and the burrito chain Chipotle agreed to buy its tomatoes from the growers involved in the program. Also from The Atlantic, some fasinating things about Ghandi, food and vegetarianism (and a little about Obama too). Ghadni has always been one of those people I’ve been really intrigued by, I may have to actually start learning more about him. Yay for frugality! Another great post from The Simple Dollar featuring 12 Clever Substitutions That Save Money (Nearly) Effortlessly. I may have to try some of these out, especially the drain, oven and carpet cleaners. Both Epicurious and Serious Eats mentioned this Cheese or Font game. Apparently its pretty addictive and wicked hard. I got a 58% on Planet Green’s Who Owns Your Food quiz. Can you do better? Alex and Brandon of A Food Coma have started a new site called Wadjeet, as in “what did you eat?”. It’s “a new social site tailored to all of us who whip out our cameras as soon as the food hits the table” and features some pretty delicious looking meals. Take a look and leave some comments.